November 14, 12 noon – Provincial Commemoration of the Holodomor, Ukrainian Famine-Genocide, Rotunda, Legislative Building. September 30, 2 pm – U of M, 7 pm – U of W. Orwell and the Refugees, The Untold Story of Animal Farm. Presented by Andrea Chalupa (New York). Sponsored by: University of Winnipeg, University of Manitoba, Ukrainian Students Association and UCC-MPC. October 25, 7 pm – Social Justice and Human Rights Teaching through Holodomor Education. Presented by Valia Noseworthy, Special Area Group Educators, Chief Peguis School, 1400 Rothesay Street. October 28, 7 pm – Mennonites and Ukrainians under Stalin. Our Human Rights, Lost and Found. Speakers: Dr. Myroslav Shkandrij, Dr. Peter Letkemann, Dr. Colin Neufeldt (Edmonton), Margaret Friesen and the Friesen-Kuzmenko Family, Mennonite Heritage Centre, 600 Shaftesbury Boulevard. Co-sponsored by Mennonite Heritage Centre, Canadian Museum for Human Rights, UCC-MPC. November 3, 4 pm – Revival of National Memory in Ukraine with historian Volodymyr Viatrovych (Ukraine). In Ukrainian. Co-sponsored by: League of Ukrainian Canadians and Ukrainian Free Academy of Sciences. Canadian Ukrainian Institute “Prosvita”, 777 Pritchard Avenue. November 4, 11 am – Revival of National Memory in Ukraine with historian Volodymyr Viatrovych (Ukraine). In Ukrainian with simultaneous translation. St. Andrews College (Centre for Ukrainian Canadian Studies). University of Manitoba, 29 Dysart Road. November 13, 11:30 am – Minorities in interwar Poland. Presented by Robert Kusnierz (Poland), University of Manitoba, Faculty of Education, 71 Curry Place. November 13, 7 pm – Holodomor 1932-1933. The view from the Polish Foreign Ministry Archives. Presented by Robert Kusnierz (Poland). Sponsored by: UCC-MPC, Department Of German and Slavic Studies (U of M), Ukrainian Cultural and Educational Centre – Oseredok. 184 Alexander Avenue East. November 17, 6 pm – Holodomor Memorial Service in chapel followed by film Harvest of Despair. Installation of black flags, Holy Family Home, 165 Aberdeen Avenue. November 18, 10:30 am – Holodomor: Murder by Starvation. A play by Fr. Edward Danylo Evanko (British Columbia). Co-sponsored by: Sisler High School and UCC-MPC. 1360 Redwood Avenue. November 19, 1 pm – New Technological Resources in Teaching Holodomor. Presented by Dr. Orest Cap and Dr. Denys Hlynka, University of Manitoba. Faculty of Education, 71 Curry Place. November 20, 2:30 pm – Researching the Holodomor of 1932-33: based on the example of the Sumy Oblast. Presented by Hennadiy Ivanushchenko. In Ukrainian. Sponsored by: Department of German and Slavic Studies, and the League of Ukrainian Canadians. University College 201 (Conference Room), University of Manitoba. November 21, 7 p.m. Researching the Holodomor of 1932-33: based on the example of the Sumy Oblast. Presented by Hennadiy Ivanushchenko. In Ukrainian. Screening of the film “Konstantyn Bokan – One of Ten Million Victims”, Co-sponsored by: League of Ukrainian Canadians and Ukrainian Free Academy of Sciences. Canadian Ukrainian Institute “Prosvita”, 777 Pritchard Avenue. November 22, 7 pm – Holodomor: Murder by Starvation. A play by Fr. Edward Danylo Evanko (British Columbia). Sponsored by: UCC-MPC. Blessed Virgin Mary Ukrainian Catholic Church, 965 Boyd Avenue. November 23, 1:30 pm – International Holodomor Memorial Day. Community Memorial Service and Holodomor Commemoration Program. Holodomor Monument, Winnipeg City Hall, 510 Main Street. November 24, 12:30 pm – Holodomor Commemoration Program. Guest Speaker Hennadiy Ivanushchenko (Ukraine). Sponsored by Ukrainian Orthodox Cathedral of St. Mary the Protectress. 820 Burrows Avenue. December 6, 7 pm – Canada’s Press and the Holodomor. Presented by Jars Balan (Canadian Institute of Ukrainian Studies, University of Alberta). Co-sponsored by: UCC-MPC, Ukrainian Orthodox Cathedral of St. Mary the Protectress. 820 Burrows Avenue. November 18, 6:30 pm – Screening of documentary Harvest of Despair, Ukrainian Cultural Centre, 241 Kenilworth Ave. N.
Ukrainian Orthodox Cathedral of St. Vladimir, 855 Barton St. E.
November 24, 3:30 pm – UCC Memorial Service and Program, Guest speaker: Andrea Chalupa writer and journalist from New York, and Right Rev. Fr. W. Makarenko, Ukrainian Orthodox Cathedral of St. Vladimir. November 18-23 – Black Flag Installations – London Ukrainian Centre, 247 Adelaide St.S. ; Ukrainian Orthodox Church Holy Trinity, 151 King Edward Ave.; Ukrainian Catholic Church of Christ the King, 707 Nelson St.; London Central Library, 251 Dundas St.
November 18-23 – Exhibit and literature display, London Central Library, 251 Dundas St.
November 24, 12:30 pm – Commemorative Program with screening of Genocide Revealed by Y. Luhovy, London Ukrainian Centre, 247 Adelaide St. S.
November 10, 2:30 pm – Town Hall meeting with historian Hennadiy Ivanushchenko, “Research on the Holodomor in Sumy Oblast” , screening of “Konstantyn Bokan – One of Ten Million Victims”, Ukrainian Cultural Centre Dnipro, Sponsored by Canadian Conference in Support of Ukraine. November 23, 1 pm – UCPBA Memorial Service and Proclamation by the City of Ottawa declaring November 23, 2013 Holodomor Memorial Day in Ottawa, St. John the Baptist Ukrainian Catholic Shrine, 952 Green Valley Cres., Taras Shevchenko monument. November 22, 7 pm – Holodomor Commemoration sponsored by Ukrainian National Federation Toronto Branch and Ukrainian Women’s Organization of Canada Toronto Branch, UNF Community Centre, 145 Evans Avenue. Bring a non-perishable food item for the Ukrainian Credit Union Holodomor Awareness Food Drive. November 24, 1:15 pm – Memorial Service, Holodomor Monument, Queen Elizabeth Gardens; 2 p.m. – Memorial Dinner St. Vladimir ‘s Cathedral hall including a screening of Genocide Revealed by Y. Luhovy. November 22, 6:30 pm – Screening of feature documentary film “Okradena Zemlya“, narrated by Bohdan Beniuk, (filmmaker Yurij Luhovy will be present), Ukrainian Youth Centre (Dim Molodi) in Rosemount. Sponsored by UCC-Montreal. Admission by Donation. November 24, 4 pm – Holodomor: Murder by Starvation, one-person play by Fr. Edward Evanko, St. Sophia Cathedral Hall in Rosemount. Presentation coordinated by UCC National with UCC-Montreal branch. 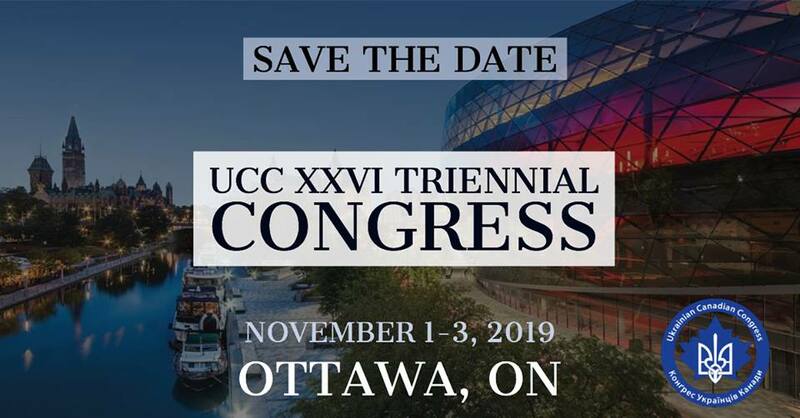 Information: UCC-Montreal, tel. 514 259 7162 or 514 725 0812.